RomeCabs' Rome in 2 Days chauffeured tours offer you the wonderful opportunity to truly experience the Eternal City and what it has to offer across two days at your leisure so you have the opportunity to explore Rome’s famous highlights as well as hidden treasures in the comfort of your private deluxe vehicle driven by your personal English speaking Driver. Pick up time at your Rome hotel is 9:00 AM. You will return to your hotel at approximately 5:00 PM. Your first day in Rome will begin with a journey through time to the glory of Ancient Rome as your Driver will take you to visit the iconic Colosseo and the Roman Forum from where the Roman empire was ruled. The Colosseum is the world’s most famous elliptical amphitheater that has inspired not only the imagination of people worldwide with the legendary events that took place on its arena, but inspired engineers and architects to create modern versions of this ancient sports stadium. The ancient amphitheater was built in 72 AD on top of Emperor Nero’s Golden House (Domus Aurea), the expansive and luxurious private residence of the emperor. Across the Colosseum, you will visit the ancient Roman Forum, often described as the most celebrated public forum in the world! Situated in the small valley between the Capitoline Hill and Palatine Hill, for centuries the Roman Forum served as the nucleus of all the most important affairs of the Empire: political, religious, commercial and judicial. 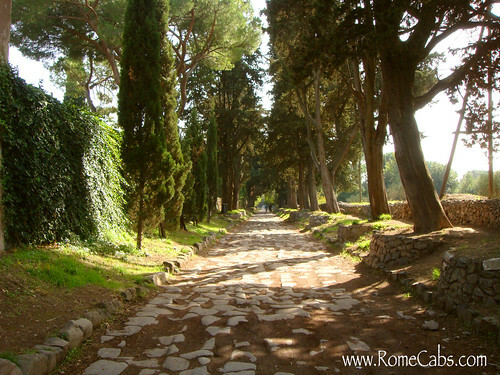 This remarkable ancient Roman road built in 312 BC is recounted in the Christian tradition that it was along the Appian Way that Peter tried to escape Rome when he encountered a divine vision of Christ which inspired him to return to the city and face is certain martyrdom. As you make your way along Via Appia, you will stop for a visit to the early 2nd and 3rd century AD Catacombs that were underground receptacles of the dead. Burial was at that time forbidden within the city walls, therefore miles of underground labyrinthian tunnels were hewn out of the tuffa stone so the early Christian could bury their dead. Lunch will be at a local restaurant or trattoria of your choice. Your driver will be happy to offer suggestions based on your tastes. After lunch your chauffeured tour will continue with a stop at the Spanish steps (Piazza di Spagna) famous for its elegant winding stairway that scales all the way up to the French church of Trinita dei Monti and the obelisk (Obelisk Sallustiano) that is a smaller version copy of the large original obelisk once belonging to Pharaoh Ramses II that is currently gracing Piazza del Popolo. At the foot of the staircase you will notice a large gathering of people around a fountain in shape of a shallow boat typically used for carrying wine to the port of Ripetta. This is the “Fontana della Barcaccio” (The Fountain of the Old Boat), a 1600’s Baroque fountain attributed to Pietro Bernini, the father of the famous sculptor Gian Lorenzo Bernini. 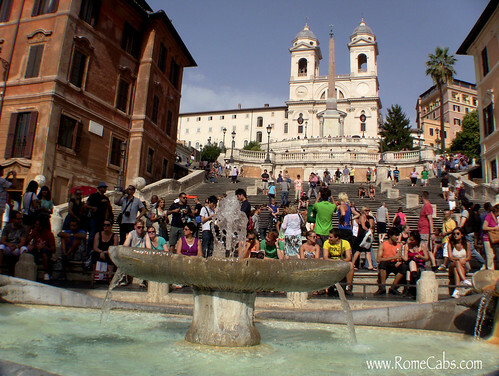 Another famous piazza in Rome your Driver will take you to is the beautiful Piazza Navona. Filled with light and sculpture, this unique piazza takes its oblong shape from the outline of the ancient Circus Domitianus (Domitian’s Stadium) that once stood here. Its centerpiece is the Bernini’s Fontana dei Quattro Fiumi (The Fountain of Four Rivers) that artistically and symbolically represents the four known rivers during the 1600’s, the Nile River, Danube River, Rio River, and Plate River. One of the most iconic squares in Rome that was featured in classic films such as “La Dolce Vita” and “Three Coins in a Fountain” is the large Baroque Fontana di Trevi (the Trevi Fountain). Hundreds and thousands of people a day toss a coin into the fountain hopeful that the tradition of tossing a coin in the fountain will ensure them a return to Rome. 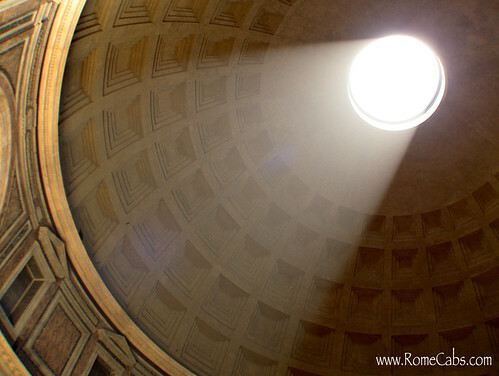 One of the most recognizable ancient Roman monuments still in use today is the Pantheon. Initially an ancient Roman temple dedicated to all the Roman gods, it was converted into a church in 609 AD and became the burial place for Italy’s royalty including King Vittorio Emanuele II, King Umberto I and his Queen Margherita....as well as famous artists like Raphael. As you stand inside the Pantheon and look up to the center of the large coffered dome, you will notice the oculus (in Latin for “eye”) that serves not only as an architectural necessity but provides light as well as natural elements to flow into the building. Drainage holes are strategically placed to drain the water from the rain. This marks the end of your First Day in Rome. From here your driver will bring you back to your hotel after a wonderful day exploring Rome. Your journey through Rome continues as your Driver will meet you at your hotel accommodation, your day will begin with a visit to Campo dei Fiori, one of Rome’s most famous squares that comes to life each morning with its open air market where you will experience a market day in Italy! This bustling market has been taking over the square each morning since the late 1800’s with vendors selling everything from farm fresh fruits and vegetables beautifully displayed in a burst of color and fragrance, to clothing, kitchen wares, souvenirs, and countless local Italian products and delicacies to tempt your palette. Campo de’ Fiori translates to “field of flowers”, a name first given to this place during the Middle Ages when it was actually a meadow. Flowers are still part of this square, but sold by vendors in beautiful bouquets for any and all occasions. A short drive away through Rome will take you to the lovely Aventine Hill, one of the Seven Hills upon which Rome was built in the ancient times, but today is an elegant residential area of Rome that includes two places of interest that are the jewels of off the beaten path enthusiasts: Giardino degli Aranci (The Orange Garden that's a well kept secret of the locals) and the Secret Key Hole. Inside the Orange Garden you will find a lovely small grove of orange trees that in the spring the fragrance of the blossoms attracts locals who delight in a quiet afternoon in this small park. Tradition has it that St Catherine of Siena made candied orange peels from the trees in this garden as a gift for the pope. The garden terrace will reveal a lovely panorama Rome with the Tiber River below, and the dome of St Peter’s Basilica in the distance. In the small and charming 18th century Piazza of the Knights of Malta you will find a rather ordinary door with a peculiar keyhole that reveals an enchanting view of the misty dome of St Peter’s Basilica, beautifully framed by green manicured trees in the garden just beyond the door. 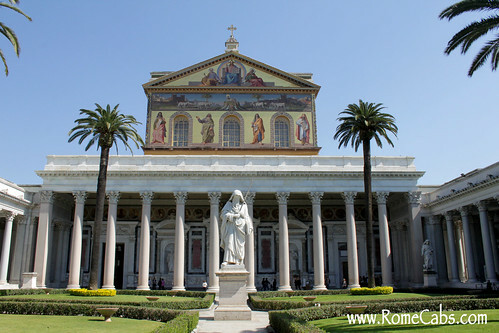 Your journey will continue with a visit to St Paul Outside the Walls, the second largest basilica in Rome and one of the four Papal Basilicas. This Basilica was originally built in 4th century by Emperor Constantine over the burial site of Saint Paul the Apostle, and it is currently one of the top pilgrimage destinations for millions of Christians around the world. This beautiful basilica has been destroyed by fire in early 1800’s, but with the generosity of donors across the continents, the basilica was perfectly restored to its previous glory which can you can admired today. One of Rome’s most imposing and famous ancient Mausoleums is Castel Sant’Angelo, the original 2nd century AD tomb of ancient Roman Emperor Hadrian that was later converted into a fortress, a castle to offer safety and protection to the popes during dangerous times of war and sieges, and a prison. The name “Castel Saint Angel” was given when supposedly Archangel Michael appeared on top of the mausoleum sheathing his sword signaling the end of the terrible plague of 590. You can see the statue representing this legendary event on top of the castle. 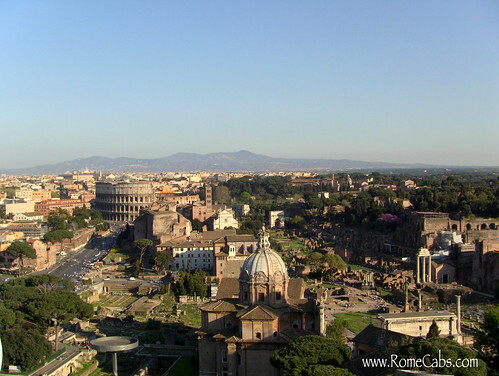 The top of the castle offers a splendid view of the Vatican and a stunning panorama of Rome that’s not to be missed! Lunch will be at a local restaurant or trattoria of your choice. After lunch your driver will take you to visit the smallest country in the world: Vatican City. Your visit will begin with the Vatican Museums with one of the most extensive and compelling collection of masterpieces in the world including the greatest artists such as Leonardo da Vinci, Michelangelo, Raphael, Giotto, Caravaggio, Titian, and more from antiquity to Renaissance. Among the most popular and visited galleries and Halls are the Raphael Rooms, Hall of the Maps, Gallery of the Tapestries, the Pinacoteca and the highlight of everyone’s visit: the Sistine Chapel that features Michelangelo’s famous frescoes. 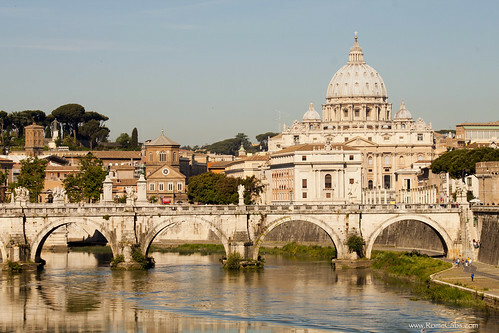 Following the Sistine Chapel you will visit St Peter’s Basilica, the largest church in Christendom and the site believed to be the tomb of St Peter himself. The Basilica itself is a breathtaking work of art where you’ll admire Michelangelo’s masterpiece sculpture the Pieta, Bernini’s Baldacchino (the bronze canopy above the altar), the throne of St Peter’s behind the altar, and the opulant Chapel of the Sacrament. Thank you very much for choosing the original RomeCabs Limousine Car Service Company for your tours and transfers in Rome and beyond. We look forward to meet you and to show you our beautiful places in Italy! Please be sure to read the important information in the Please Note section on this page before booking this tour. * The price of the Rome in 2 Days Tour includes private deluxe vehicle with a professionally licensed English speaking Driver Guide, Italy VAT tax, fuel, insurance, and parking fees. * The price of the Rome in 2 Days Tour does not include entrance fees, lunch, gratuities, private tour guides if hired separately, or other client personal expenses. * This tour is priced for pick up and drop off at Rome accommodation only. For pick ups or drop offs at Port of Civitavecchia please write us for a price quote. * Do you wish to book a tour for more than 8 persons? Please click here to find out how to book multiple vehicles for parties larger than 8. Payment for the tour will be made in Euro currency at the end of each journey. You may also pay in full in advance via PayPal. Please let us know when the tour is confirmed that you wish to pre-pay via PayPal. Please print your payment voucher and present it to your driver at the time of service to confirm pre-payment. It has been reported that starting in May, the Pantheon will being charging Admission Tickets (currently estimated at 2 EUROS Per Person). Please be prepared for potential ticket lines or wait times to visit the Pantheon. Price of Colosseo standard Admission Tickets booked online is currently 14 Euros per person. Please purchase your tickets to the Coliseum in advance at the link below. If you are from United States, please select "Stati Uniti" when prompted to select your country of origin. Price for Vatican Museums Admission Tickets booked online up to 60 days advance at the current rate of 21.00 Euros per person. Please book your tickets for the 2:00 PM time slot. IMPORTANT: Be sure to print your Vatican Museums and Colosseum ticket vouchers at home and bring them with you. 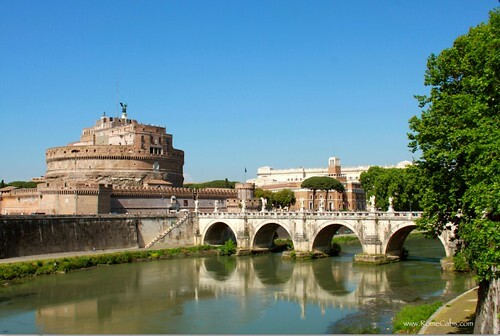 * Price for Castel Sant’Angelo tickets are currently 10.50 Euros per person if purchased on site upon arrival. Prices are subject to change, and there may be a line to the ticket office to purchase the tickets. If you prefer to skip the lines with No Line Tickets purchased in advance via concierge service, please inquire within for more information and prices. * Entrance fee to visit the Catacombs are currently 8 Euos per person to be purchased on site on arrival, and it includes a group guided visit available in various languages with explanation of the fascinating underground world you will explore. * Please Note that prices for entry tickets are subject to change pending occasional exhibitions, changes are always at discretion of the monuments and museums. We accept no responsibility for ticket price changes that may occur after you book this tour. * Churches in Italy may close for private religious affairs with no advance notice. In such cases, the church in the itinerary will be replaced with another beautiful church. This tour provides a Tour Driver who is not a licensed tour guide. Italy has strict laws that protect licensed tour guides, thus it is unlawful for Tour Driver to act as a guide and accompany guests to sightsee away from the vehicle. Your Driver will be obliged to remain with the vehicle while you sightsee. * Your Driver will drop you off as close to the sites as close as legally possible and in accordance to the Municipality and Traffic laws of Rome. Please let us know when you book your tour if you are requesting a private guide for the Colosseum and/or the Vatican City. Payment for private guides is made directly to the guide in Euro funds at the end of their guided tours. Please read all the information below before allowing us to book a licensed guide on your behalf. 120 Euros for a group of up to 6 people. 150 Euros (+ 3 Euros per person for earphones) for a group up of 7 or more. For a party of 7 or more, please book your Vatican Museum tickets at 1:30 PM. Payment to be made directly to your private tour guide at the end of the Vatican tour. 150 Euros (+ 3 Euros per person for earphones) for a group up to 8 people. Payment to be made directly to your private tour guide at the end of the Colosseo/Roman Forum tour. IMPORTANT TOUR GUIDE DISCLAIMER: Private licensed tour guides are not employees or affiliates of Rome Cabs as they operate independently. We place the reservation for private guided tours with My Rome Guides on behalf of our clients as a courtesy service. We receive no compensation nor benefit in any way from the guides. We recommend their services based on their lawful qualifications, expertise, professionalism and reliability, but we have no control of the style of tours they provide. Please be advised that Rome Cabs accepts no responsibility or liability for the style of tours Private Guides provide as they are not part of Rome Cabs company. By allowing us to book a private guide on your behalf, you are entering an agreement that you fully understand and accept all the conditions above with no exception. Don’t worry, we never ask for your credit card information, require advance payments, or charge you for cancellations. We operate on the time trusted honor system, so we respectfully ask that all cancellations be made at least 7 days in advance so we have the opportunity rebook your service and your reserved driver does not lose work for that day. Thank you for your cooperation in this matter. Please read the Terms of Service prior to placing your reservation. IMPORTANT: This is a chauffeured tour with Driver, not a walking tour with licensed tour guide. The Vatican is a vast place with a labyrinth of halls and galleries that it can make for overwhelming experience for first time visitors, and with so many precious works of art that are often missed without the guidance of an expert, we highly recommend hiring a private English speaking licensed Vatican Guide to accompany you on a 2 hour tour through the Vatican Museums, Sistine Chapel and St Peter's Basilica to enhance your experience and knowledge of your visit to one of the most unique places in the world. Please see the side column “please note” section for more information on private licensed tour guides. It’s advisable to bring a bottle of water, sunscreen and a hat to protect our head and shade your face with during the summer months as it becomes quite hot and sunny while visiting the Colosseum and Roman Forum. All visitors are obliged to pass through security, including ticket holders. Wait lines vary. Any delays associated with visiting the Colosseum are outside of our control. The area around the popular sites can become quite crowded, especially during the peak travel months, so be aware of your belongings and keep them close to you. Do not accept ‘gifts’ from street vendors approaching tourists around the fountain. Rome is a very safe city, but as with any place in the world it is good to travel with common sense. Photography and videography is permitted throughout Vatican Museums, with exception of sensitive areas where flash photography is forbidden. Please check the signs that advise you of this. You may use flash photography and videography freely inside St Peter’s Basilica. Any form of photography and videography are strictly forbidden inside the Sistine Chapel. Please note that during the summer months the Vatican Museums are very crowded, often hot, and it may or may not be an enjoyable experience for everyone who is sensitive to crowds and heat. To enhance your experience during your visit to the Vatican and Colosseum and Roman Forum, we highly recommend a professional private tour guide as he or she will provide valuable information about the places you visit. In the Colosseum and Roman Forum the ruins may not appear so exciting until you fully understand what they used to be during the Roman empire, their functions and roles in Rome’s civilization. As mentioned above, the Vatican is a labyrinth of halls and galleries brimming with important works of art that are easy to miss without the guidance of a tour expert that will show you all the “must sees” and explain to you what you are looking at so you leave with knowledge and understanding of the amazing places you visit. Please remember that it is required to dress appropriately when entering the St Peter’s Basilica: no bare shoulders or bare knees. Capri-type pants are acceptable for ladies and men can wear shorts that are long enough to cover the knees. Ladies, if you wear a tank-top, bring a scarf or shawl to cover your shoulders. Persons who don’t respect the modesty dress code are turned away and denied entrance into this holy church as well as the Sistine Chapel. Please click to Read: "How To Dress When Visiting Churches in Rome"